But seriously. Strolling and wandering around Denver is one of our most favorite things to do. There are so many places to explore for little to zero cash, and so much to learn. In order to wind down from the stresses of the day, and honestly, to get those damn steps in, I meandered down to Civic Center to look around and take those last breaths of summer in. There are over 250,000 square feet of flower beds, perfectly arranged in patches among the center grass. Perfect for walking around and admiring… and pretending you’re a part of the animated, old school Alice in Wonderland. My favorite shot of the evening was looking at the Capitol building through the bright, red flowers and admiring the different hues of the capitol building: the rose onyx structure and the 24-karat gold leaf dome right as the sun was beginning to set. It never gets old wandering around, even if it’s the same place. I’ve probably visited Civic Center a hundred times since we’ve moved here over two years ago and always learn something new. Between the sculptures and the capitol building, I’ve learned a ton just reading up on the inhabitants of Civic Center after each walk. The dome of the Capitol building actually used to be made out of copper, but was swapped out for gold in 1908 due to the copper getting dull and taking on a weird finish over time. Wow, a gold dome? Pretty fancy! Indeed, and it actually symbolizes commemoration for the Gold Rush and all of the miners who helped build this beautiful state. Per our friends at Colorado.com, The structure of the Capitol is made from Colorado rose onyx (also known as Beulah red marble), a type of stone so rare that all known reserves were used in the capitol’s construction. The Colorado rose onyx itself was quarried in the town of Beulah, Colorado. Check out that shot of the Capitol at dusk – BEAUTIFUL! 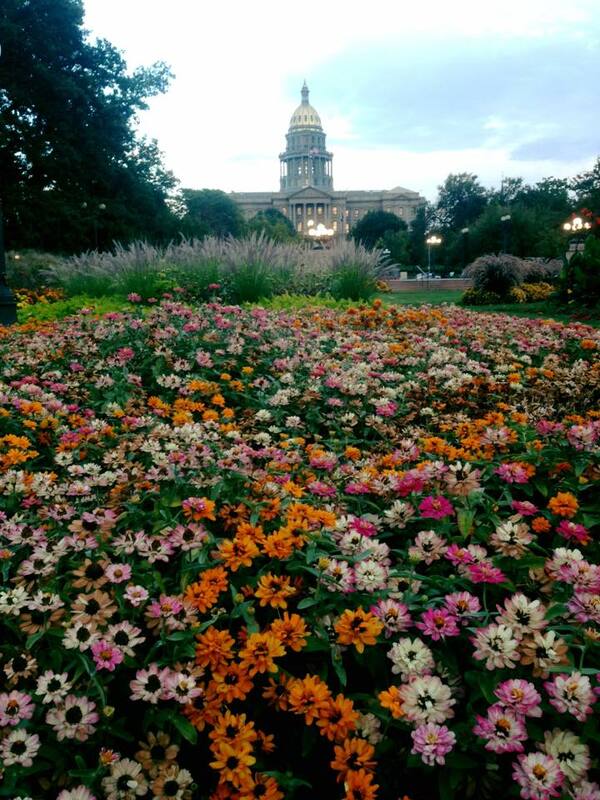 Wander around and check out all of the cool things inside Civic Center park, and feast your eyes on the Capitol while the sun sets. There are so many cool ways to capture its history and beauty. ← Where Has The Summer Gone!? !